So at this point my love for Josh Rosebrook products is pretty clear, as evidenced by my love letters to both his Tinted Day Cream* and Oculus Eye Oil*. And today my love for the brand continues with a mini review of a few other treats that the line has to offer. First up is his wonderful Nutrient Day Cream*, the dreamy product that made way for his recent launch, the Tinted Day Cream. Formulated with some seriously skin loving ingredients, this guy provides your skin with SPF 30 sun protection, using non-nano zinc oxide (the only sun protection that has never clogged my pores). It's really a perfect little daytime moisturizer that provides just the right amount of hydration and protection from the sun that you need for summer days. Next up is a bestseller from the line, the incredible Deep Nourishing Shampoo*. This gem is aptly named, and I've found it to be wonderfully nourishing for your hair. The plethora of effective natural ingredients that make up the formula for this one all work together to gently cleanse and detoxify your hair without ever leaving it dry or brittle. My hair is usually on the oily side, but I've found this formula leaves my hair feeling light without ever being stripped of all hydration (a common problem with shampoos). In fact, I find this guy to be so nourishing for my hair that I actually rarely follow up with a conditioner, as I feel it gets both jobs done at once. I can certainly see why this is a bestseller - it works for all hair types, not a common trait for a shampoo. Lastly I tried two different masks from the line, both the Cacao Antioxidant Mask* and the Active Enzyme Exfoliator*. The Cacao Antioxidant Mask is a thick, highly effective formulation that smells wonderfully like chocolate (yum!). The potent antioxidants in the formula work to increase blood circulation, so when you leave the mask on for the designated 45 minutes you're left behind with truly rejuvenated skin. Similarly, the Active Enzyme Exfoliator works to reinvigorate your skin, but this one uses plant, fruit and herb enzymes to remove any dead skin cells, while the honey in the formula works to hydrate the fresh skin underneath. You can leave this guy on for anywhere from 10 minutes to an hour, and I've honestly had great results for each. It's never irritating but instead is a straight up highly effective mask and perfect addition to any skincare routine. 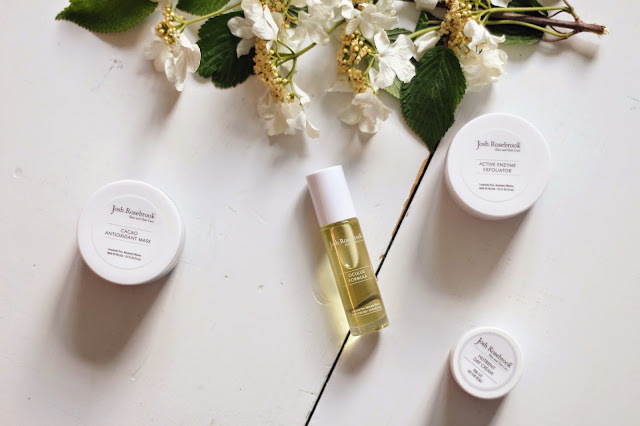 My love for Josh Roebrook continues to grow - all of his products, whether they're for skin or hair, are unbelievably effective and I've yet to be anything but impressed with the results. Have you guys tried anything from the brand? I'd love to hear recommendations on what to use next! This brand is wonderful! I'm eyeing the Deep Nourishing Shampoo and the Active Enzyme Exfoliator.